izumilog: Outdoor AD panel .Harbour City. Outdoor AD panel .Harbour City. It is extremely cold inside the buildings here. Whenever I go to shops, there are always lots of mainland Chinese around me. They don’t buy those brands that they don’t know. Instead of making purchase based on personal taste & preference, to them, the most important factors are whether the branded shops are locating at good locations, how well-known the brands are and how reputable are their advertising. 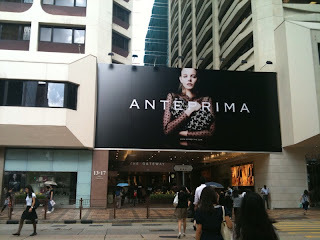 It is necessary for ANTERPRIMA to advertise to enhance both brand awareness and image too.